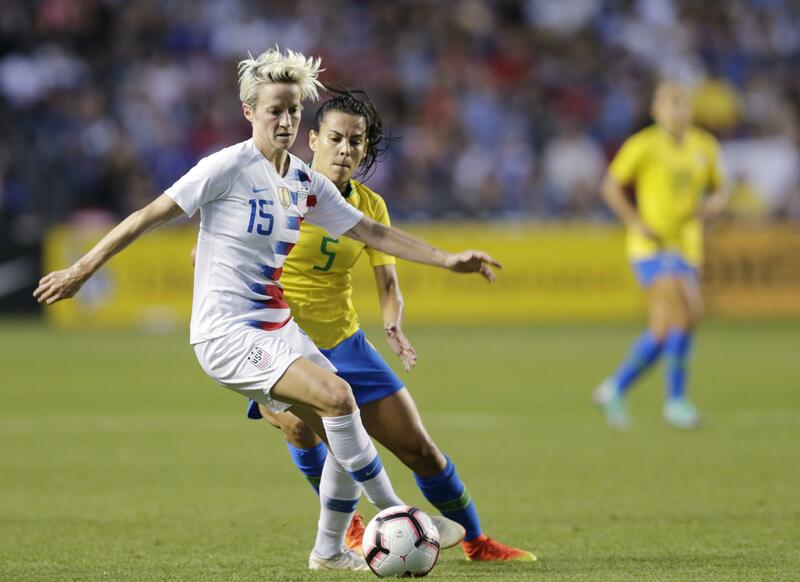 BRIDGEVIEW, Ill. – Julie Ertz, Tobin Heath and Alex Morgan scored second-half goals and the United States took control to beat Brazil 4-1 on Thursday night for the Tournament of Nations title. Heath’s curling goal in the 62nd minute put the United States up 3-1 and gave the team the margin it needed to edge defending tournament champion Australia. The Matildas edged Japan 2-0 earlier in the day at Toyota Park, putting pressure on the Americans to beat Brazil by two goals to finish atop the table. Morgan helped secure the title with her 90th international goal in the 77th minute and the Americans extended their undefeated streak to 19 matches. The United States has not dropped a match since losing 1-0 to Australia in the Tournament of Nations last year. There was concern in the final moments when Morgan was stretched off with an apparent injury, but she was on her feet for the trophy ceremony following the game. Morgan had four goals in the tournament. Brazil, ranked No. 7 in the world and led by five-time FIFA World Player of the Year Marta, has already qualified for France. The Brazilians struck first with an own goal that hit Tierna Davidson in the 16th minute. But Lavelle tied it with her third international goal in the 33rd minute. Ertz pulled the United States in front with a sliding goal off Heath’s cross to the far post in the 53rd minute before Heath added her own goal. Alanna Kennedy and Sam Kerr each scored for Australia in the opening game at Toyota Park. The eight-ranked Matildas have a secured a spot in the World Cup. Japan, ranked sixth, has also qualified for France. Published: Aug. 2, 2018, 8:13 p.m.